In the cotton-growing district outside Bahawalpur city in Pakistan’s southern Punjab region, a group of women gathers at the house of a local farmer. It is the end of the cotton-picking season when women bring in the crops. On entering the room, each woman takes off her shoes and loosens her chador, the large shawl worn across the face in conservative areas such as this. The women have come here to learn how to protect themselves from the pesticides sprayed earlier in the season. “We used to suffer from skin problems, such as rashes, as well as dizziness and headaches,” says 35-year-old Zohra Bibi, who is married to a local subsistence farmer. “Whatever we have learnt, we have taught our men,” she continues. “We’ve told them to wear plastic bags on their hands [gloves are too expensive] and to wear closed shoes and caps when they go to spray the fields”. These training sessions have been organised as part of the Better Cotton Initiative, (BCI), a global programme made up of producers, international retailers, and not-for-profit groups. The initiative counts Ikea, and H&M among its commercial partners and training activities are organised by the environment group WWF, Oxfam and local civil society organisations. Over-use of pesticides is a widespread problem in Pakistan. In almost every village in the cotton-growing belt, pesticide and fertiliser salesman arrive each cotton season selling sprays and bags of varying quality. The rates for pesticides range from Rs 300 (around £4 or US$6.50) to Rs 3,000 (£41 or US$65) a litre and farmers often go into heavy debt to buy these chemicals. Overuse of fertilisers can also destroy the quality of the soil by increasing its acidity levels. In the past five years, WWF-Pakistan along with its local partner, the Kissan Welfare Association, have conducted hundreds of training sessions, known as farmer field schools for small farmers in the area. Once a week, farmers meet for around three hours to study a selected field. Around 25 farmers participate, usually with two facilitators. The farmers are split into groups of five and they are asked to prepare a presentation on their findings with charts and drawings – used because many farmers are illiterate – to show what they have learnt. “Before [these meetings], we didn’t know which fertilisers to use or how much pesticide we should be spraying. We used to waste our water and our money,” says Mohammed Nasir Sarwar, a farmer and one of KWA’s master trainers. The farmers now have their soil tested in a laboratory – a procedure costing just Rs 2 (less than one pence). Since the field schools were launched six years ago, the farmers have reduced water and pesticide use by 75 per cent. Partly as a result of spending less money on fertiliser and pesticide, and partly due to better growing practices, the farmers have also increased their overall net revenue by 70 per cent. What started as a small NGO project run by WWF-Pakistan has become a successful business model. 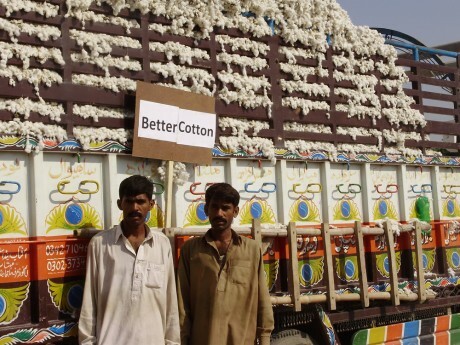 In 2010 the BCI announced its first ever ‘Better Cotton’ harvest. By December that year almost 50,000 metric tonnes of cotton had been grown and processed in accordance with BCI standards and is now available on the global market. This is a drop in the ocean compared to overall production in Pakistan – and the rest of the world – but it is a start. The BCI intends to expand the project beyond Pakistan and India to China and Central Asia. Asfar Hasan of Matrix Sourcing, a Lahore-based company that supplies cotton to Nike, agrees. “It is coming out of our conscience and consumers can relate to this initiative,” he explains. 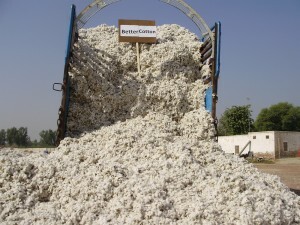 Creating enough sustainable cotton to supply international demand will be tough. Only five per cent of Ikea’s products, for example, currently use sustainable cotton. It has pledged to increase this to 100 per cent but how quickly the company achieves this goal will depend whether producers can grow enough. That day is still a long way off. However, BCI cotton production is growing. 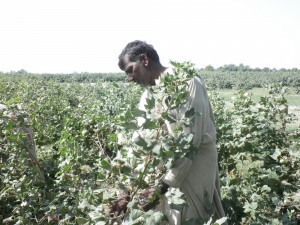 From a pilot project of 25,000 hectares, cotton under the initiative is now being grown by 40,000 farmers in Pakistan on a total of 400,000 hectares. Naqi Khan is convinced that if other brands in Europe and the US follow this initiative then they will create a demand for sustainably grown cotton in Pakistan and become a lever for change.